New Order stock is always available. Authorizing an infinite number of shares for purchase was one of the best business decisions we've ever made. We have opened the financial future of highsec to the masses. No one can accuse us of being snobs, that's for sure. Density Xavier referenced her recent purchase of 155 shares when asking her question about how to buy a permit. 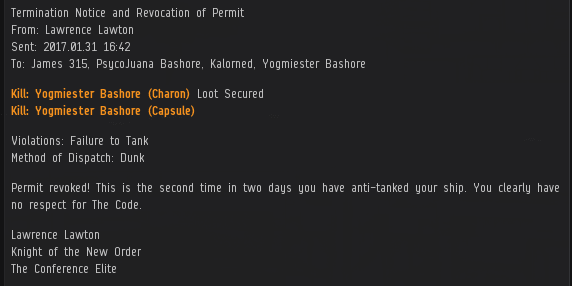 I already gave Density the instructions on how to buy a permit, but let's talk about the shares: Her purchase sent us exactly to the 1 trillion 116 billion isk mark (good timing and math!) and earned her a Supreme Protector's Tip of the Hat™. Burn Jita was the gift that kept on giving. Super Perforator celebrated the event by purchasing 2,555 more shares of New Order stock, sending us over the 1 trillion 117 and 1 trillion 118 billion isk marks. By adding to her already sizable holdings, she earned a Double Supreme Protector's Tip of the Hat™. Meanwhile, Apo123 increased his own holdings, purchasing 315 more shares. 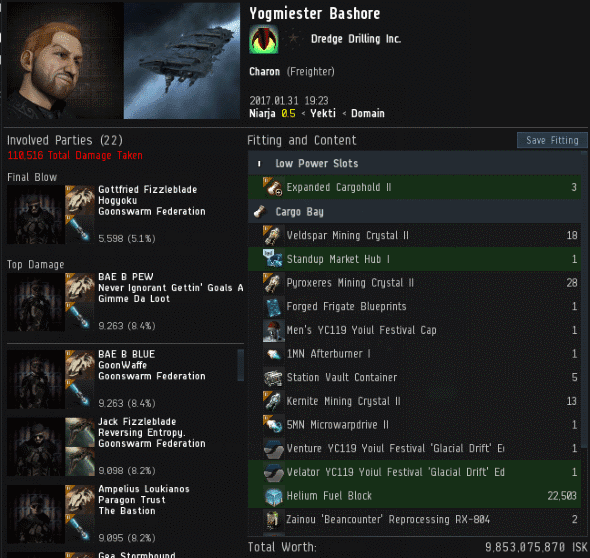 This was enough to get us past the 1 trillion 119 billion isk mark and earn him a Supreme Protector's Tip of the Hat™. Celebrated philosopher and Agent Bing Bangboom was in a reflective mood this week--as he often is when purchasing New Order stock. Bing bought 2,000 more shares, and this sent us over the 1 trillion 120 billion and 1 trillion 121 billion isk marks. He earned a Double Supreme Protector's Tip of the Hat™. Super Perforator and Bing Bangboom are both getting close to breaking into the top five shareholder positions. I told you to keep an eye on those two. Buying a lot of New Order stock--particularly at the highest levels--is pretty darned elite. It's basically EVE's endgame content. But what, you ask, is there to say about the low-level EVE player? Such as the lowly freighter pilot, for example? Step one: Get a permit. Buying a mining permit makes life in highsec much easier. It's like... It's like going to Chill Penguin's stage first in Mega Man X so you can pick up the speed boots. 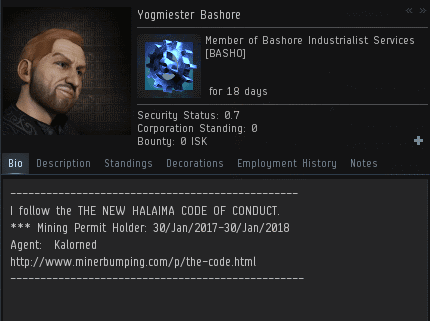 Trust me, get yourself a mining permit as soon as you can. Lesson number two: A mining permit is a requirement of the Code, not a license to violate the Code. The day after getting a permit, Yogmiester Bashore lost his freighter. He was triple-anti-tanked at the time. Yogmiester had a well-documented history of flouting the tanking requirement of the Code. The freighter pilot was more concerned with someone telling him to do a hauling job. Carebears, if you're that worried about what someone is telling you to do, and that person's name isn't James 315, then you're doing EVE wrong. The case of Yogmiester was a sad one. 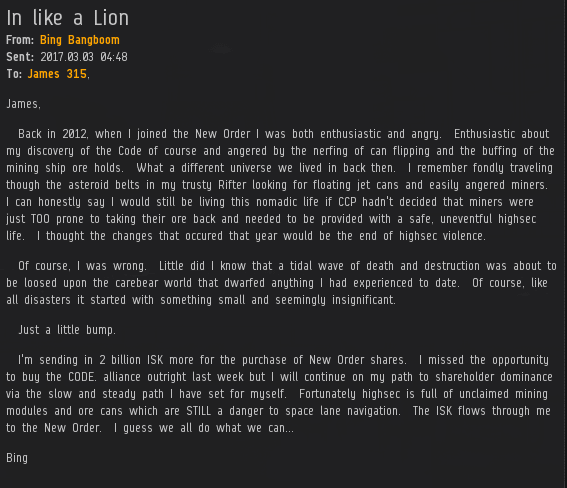 His owner, new to EVE and impatient to attain his concept of the "optimal experience," decided to spend a pile of RL$ to skill inject a few characters in order to fast track a career of bot-aspirant Highsec mining. Flush with ISK from PLEX, he casually paid for a site license permit without taking the time to internalize The Code. To be a hero to the corp that adopted him, he volunteered to fly their shiny new Azbel--and a bunch of other bulky junk--to its anchoring site, but was intercepted on the way. The bumper reported that Yogmiester refused to pay a ransom and expressed outrage at the very notion, so he was relieved of his cargo and placed on the Red Pen List. Yogmiester was booted out of his player corp for failing to deliver the Azbel, so struck out on his own. He was last seen clinging to his revoked permit while attempting to mine compliantly in a Skiff. When I invited him to pay the 30m to remove his name from the Red Pen List, he attempted to throw one of his old corp mates under the bus, then claimed poverty and blocked me. His introduction to EVE was a harsh one, but we stand ready to induct him into proper Highsec society when he addresses the remaining administrative barriers. ....and thus another rebel begins one of the many joyous roads to freedom. Wait. Didn't somebody take that phrase? Liberty, was it? TDD Dominaters? Sartre? Well, at least in Agent Lawrence Lawton Yogmiester has a guide of unparalleled patience and tact, backed up, naturally, with Void S.
When will antiganking release their donators list? OR, there are no donors because: greedy miners!